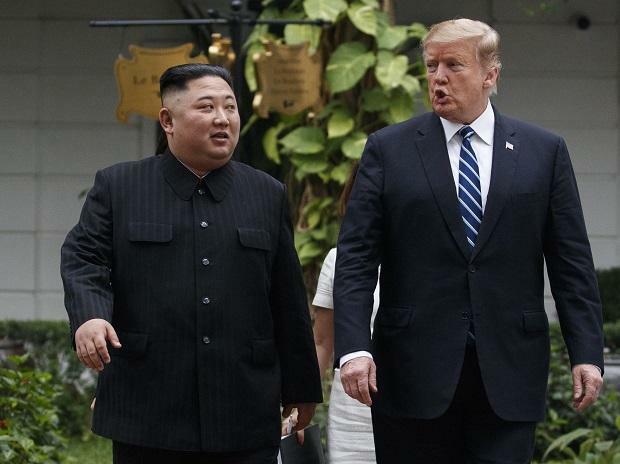 President Donald Trump’s second summit with Kim Jong Un collapsed Thursday without an agreement between the two leaders, plunging future talks on North Korea’s nuclear program into question. “It was about the sanctions. Basically they wanted the sanctions lifted in their entirety, and we couldn’t do that,” Trump said. Trump and Kim separately departed Hanoi’s Sofitel Legend Metropole hotel before 1:30 pm local time. Trump is expected to hold a news conference at 2 pm, two hours ahead of schedule, Sanders told reporters in Hanoi. The leaders had earlier planned to sign a joint agreement at 2 pm, following a working lunch. It isn’t clear if the lunch proceeded as scheduled; reporters were ushered from the dining room at the hotel before seeing Trump, Kim or their aides following a morning of private meetings. Sanders didn’t say why the summit’s schedule was abruptly changed, and initially told reporters that “negotiations are ongoing” when asked whether there would be a joint statement. Asian stocks extended declines along with US futures after the US-North Korea summit ended without any ceremony. Korean assets dropped and the yen advanced. Thursday’s summit was not the first time Trump abruptly left an international gathering. Last year, the US president skipped meetings on climate change and green energy at the G7 summit in Canada to leave early for his first summit with Kim Jong Un in Singapore. Trump’s departure came after he publicly clashed with other world leaders over his decision to impose tariffs on steel and aluminum imports. “I said bye-bye, nothing else works!” Trump wrote. A former South Korean nuclear negotiator said that Trump was right to abandon the summit if he decided it was unpromising. “No agreement is better than a bad agreement,” said the former negotiator, Chun Yungwoo, who is chairman of the Korean Peninsula Future Forum. For his part, Kim publicly said that he was willing to denuclearize, in answer to a question from a US reporter -- the first time he is known to have taken questions from American journalists. He also said that the US and North Korea establishing respective diplomatic offices in each other’s countries would be a “welcome idea,” without committing to it. “Let me assure you I will do all my best to bring a good result ultimately,” he added. But Trump has for sometime said he is not in a hurry to cut a deal with Pyongyang, which is under heavy US sanctions in response to Kim’s nuclear weapons and missile tests. The summit was organized in Hanoi in haste after Trump announced the meeting on Feb. 8, and the White House sought to lower expectations even before the president left for Vietnam.